“What do you want to be for Halloween?” I asked Bradley at dinner time. “I want to be a hot dog,” Bradley said between bites. He said it so matter of factly. He didn’t have to think about it. He just wants to be a hot dog for Halloween. It just so happened that Connie, my boss, was out shopping today and actually found a hot dog costume. Bradley loves his costume. It makes me laugh. He looks so goofy, but cute. When I was taking Bradley’s picture in his costume I told him to smile. 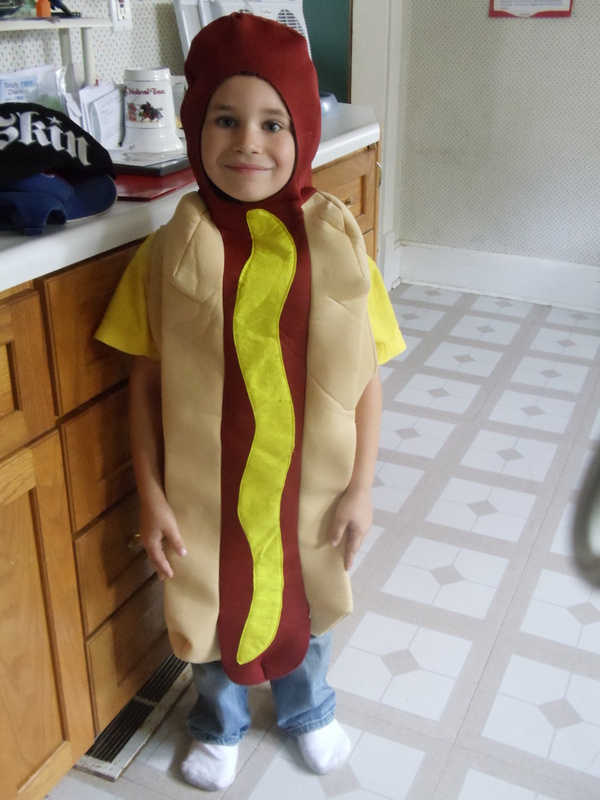 “Mom, hot dogs don’t smile,” he said to me. “Oh, just smile for the picture, please,” I urged him. This is way different from his costume from last year (which I didn’t get to help pick out because I was in the hospital on bed rest).